Competed from a young age at national level and progressed into Masters in the last 8 years. I have been consistently ranked in the top three in freestyle and backstroke events over the last few years. Now a GB records holder in 800m & 1500m freestyle, World record holder in 4x100m ladies freestyle relay, GB record holder in 4 x 50m ladies freestyle relay. 3 times European record holder in 4 x 200 ladies relay. Once I tried open water swimming, I got hooked wining the 1500m Windsor River swim and Adur River swim, but there is nothing better than a chilled swim with friends. In 2015 I swam the Gibraltar Straits clocking the 3rd fastest female. It was an amazing swim. In my spare time I love to coach, my aim is to help each individual achieve what they want to achieve with their swimming. Croatia, Greece, Malta, Thames, Jurassic Coast, Burgh Island, Loch Ness!! Swimming in Lake Garda. Every time I breathed to one side I could see the view down the lake and the amazing mountainous setting, it was magical. A special time as I was swimming with all my friends and my husband was in the safety kayak. We’re all different, find the things you need to work on to make the most of your swimming. Mine are to breathe out and hips up! When not swimming or swim coaching I might be found on a mountain bike. I have come into swim coaching from a triathlon background. I have competed in triathlon and Aquathlon for many years and have been fortunate enough to represent Great Britain at age-group level in European and World Championships all over the globe. 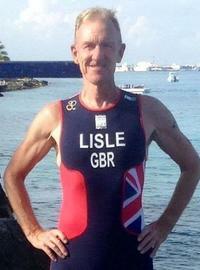 I am a level 2 Triathlon coach and am lead open water coach for my club Merseytri. 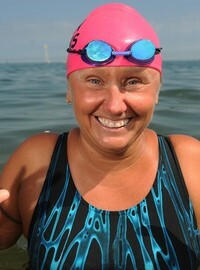 I also coach "Introduction to open water swimming" courses for my local authority Sefton at the local marina in Crosby. I have worked as a RNLI beach lifeguard and organise a joint annual sea Aquathlon for the lifeguards and triathlon club members. I still compete in Triathlon at the highest level I can and have taken up the exciting new sport of swimrun . Racing as a team adds a new dimension and of course glamorous locations enhance the experience. The swim leg of the Escape From Alcatraz triathlon. This involves jumping off the Alcatraz ferry and swimming back to San Francisco. Breathing to the right gave me fantastic views of the Golden Gate bridge. My proudest swim achievement was closer to home. The cross-Mersey swim is just over a mile in distance but the "window" you get before the tide turns is less than half an hour so the last 50 metres feels like swimming in a sideways moving flume tank ! Check out water conditions before you start. Take into account the temperature/sea conditions and take local advice especially when swimming in a new location. I am a semi-retired P.E. teacher but keep myself busy with work as a film extra and licensed dog walker. I grew up in Zimbabwe where most kids spend all their free time playing in the pool and I also swam competitively up to the junior national level. 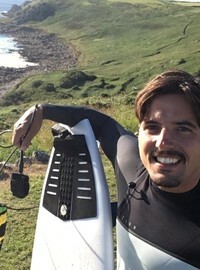 After moving to the UK I worked as a beach lifeguard in Kent for three years but my love of open water swimming didn't really blossom until I moved to Scotland. It was there on the west coast that I discovered how good it can feel to swim in nature - even when it's snowing! I've competed in a few off-road triathlons but my running always lets me down, I've never enjoyed it as much as swimming or cycling! My first will be Kornati Islands in Croatia this summer. The Sleeping Pool, Chinoyhi Caves in Zimbabwe. This is a system of caves that has many folklore stories attached to it involving magical powers. It is so deep that people have dived to 172m and not reached the bottom. The water is so crystal clear that when swimming in it, you almost feel as though you could be flying. Always tell someone where you are planning to swim and when you expect to be back, be sure to check in with them when you do get back. This is good practice even if you are going in a group. Things can go wrong quickly in the sea and this information could be invaluable to the rescue services. Last year, I decided to quit my job and sell all of my belongings in order to cycle barefoot around the whole UK coastline, wild camping each night and taking my miniature dachshund for company. I grew up along the east coast of South Africa near Durban. The ocean was my backyard and where I spent countless hours surfing and swimming. I started surfing at the age of 8 and prior to this was involved in the junior lifesaving/nippers from the age of 6. Here I learned about the ocean and developed my love of the sea, the waves and the beach environment. My love of the ocean has taken me across the world to top surfing destinations including Indonesia, Europe and South America. I have 7 years experience as an RNLI Beach Lifeguard in Cornwall. Look forward to my first trips at Burgh Island and Milos in Greece. When I was 8 years old, one of the lifeguards took me on on the front of his canoe far out to sea to look at a Humpback Whale. I lay on the front no more than 10 m away and watched in awe as it surfaced to have a look at us . Luckily it did not decide to breach at that time! Get used to keeping your goggles on for long distance swimming. You can squint your eyes to allow a small amount of water to seep in to help keep them fog free. Growing up by the sea, I’ve been in the water since a young age. I joined my local lifesaving club while at school, from which swimming and lifesaving became a big part of my life. 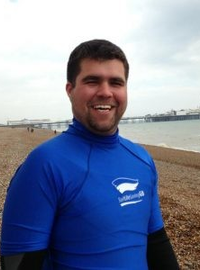 I spent several years working as a beach lifeguard in Brighton, both on the beach and a patrol boat, and then as a Seafront Officer – managing and training lifeguards and working all year round on the seafront. I also worked for a while at SwimTrek HQ, so am pleased to be returning as a guide in SE Asia! Probably completing a channel relay swim with the SwimTrek office team back in 2016… and the many hours of winter swimming to prepare for it. Make sure you understand what the water is doing and the environment you are getting in before you go in – to both keep you safe and to help you plan. I have been swimming my whole Life. I started swimming for a swim club at 6 years old and my longest time out of the water has been during a long and nasty cold or the 3 weeks after giving birth to my son Erik, I just love swimming. After my son was born I started my journey as an open water swimmer. I did a WC race in Copenhagen before I went to Dover. From there I started on my Seven Oceans journey. From 2010 to 2013 I was the first female to finish the Seven Oceans and second person in the World. In 2018 I got nominated to the International Marathon Swimming Hall of Fame. When I completed the Seven Oceans with the North Channel swim in 2013. Have everything ready; your favourite swimsuit, goggles and swim hat ready to go. An extra pair of your swim gear in your bag/ boat. Sun cream if necessary and maybe some Vaseline to prevent jellyfish stings. Sunglasses to protect your Eyes and even have dark swim goggles and light ones if you are going to swim in the dark. I'm going to build a house by the sea this summer! Back in the day I was a double British National 5k Open Water Champion and represented Great Britain and England in open water events. In my quest to reach the top, I swam in many locations all over Britain, competing in races from 5k to 25k and also briefly visited France as a member of an English Channel Relay team. I had a break from competitive swimming while working in London and bringing up a young family but I never lost the love for open water swimming. I often travelled for work and used to hunt out locations to swim to get my daily fix. I spent many hours in Lake Zurich with the Alps as my backdrop. These days I swim outdoors all year round be it in a pool or in open water. I now compete as a Master, anything from 50m to 10k and hold numerous county and regional records, national titles and have medalled at the Europeans and World Masters in 200m Butterfly. In 2018 I turned my back on my corporate life with the aim of simply spending more time in, on and around water. I have achieved this aim and now take great pleasure in teaching children and adults to swim. I also coach and provide water safety at events. I am passionate about swimming and I love my new life; in, on and around water all over the world. One very special moment was crossing the finish line first at the National trials for the 5k and, as a result, being selected to represent Great Britain at the European Championships in Vienna. These days, more memorable moments include spending time with a great group of friends in the River Deben in Suffolk; the cold, the warmth, the laughter, the sheer joy of open water. Listen to your body, relax and enjoy! I used to be suited and booted, working in the 'Gherkin'.